Did you know that if you have a blog and you don’t do some sort of New Year’s “best of” post, they cut off one of your fingers? It’s true. What follows are a dozen of my favorite posts from 2014. They’re not necessarily the best, since that’s subjective, or the most popular, since in most case I have no idea which ones those would be. These are just the 12 posts that I look back on and go “Yeah, that was a fun one”. In theory, that criteria should be impossible to disagree with, although I’m sure somebody will try. So if you’re stuck at work on New Year’s, or travelling, or spending time with your loved ones, here are 12 posts from 2014 that you can spend your valuable time on. My gift to you. January 14 - The NHL dictionary: Advanced stats, the Bettman Point, Old-Time Hockey, and multiple lockout entries. January 16 - Death to the loser point: Never let it be said that I don’t use my platform to talk about the important issues. January 21 - NHLPA ’93 vs NHL ’94: the ultimate breakdown: The most-read thing I wrote all year, and it’s not close. I’ll leave it to you to decide whether I should feel proud of that. January 27 – California Love: My trip to the Dodger Stadium game: The thing about the Glenn Anderson Freeway is real, by the way. February 13 - Ranking the NHL’s worst contracts: Did it take me almost 5,000 words to get to an answer everybody already knew was coming? Sure, but I was venting. April 15 - Get in the Ring: A celebration of the 1988-89 Detroit Red Wings: “Hey, we need a detailed breakdown of the old Norris Division in which each team is compared to a member of the original lineup of Guns N’ Roses." Uh, yeah, I might know a guy who can help with that. June 6 - NHL Playoff Quest: The computer game online walk-through: “This is unquestionably the most obscure genre you will use to write hockey humor all year," they said. “Oh, maybe check back in December," I said. July 24 - The most depressing passage from every team’s Wikipedia page: Sometimes the best concepts are the simple ones. August 8 - Signs you’ve hired a bad advanced stat guy: A little old school DGB material for the diehards. 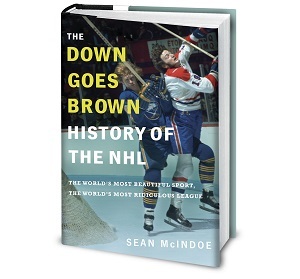 October 23 - The Kurvers Effect: How one terrible trade changed NHL history: An alternate history of the universe in which Floyd Smith doesn’t ruin everything. November 14 - A farewell to NHL enforcers: I honestly never thought I'd write this sort of post. This one generated a lot of feedback, some of it ugly but most of it along the lines of "Yeah, me too". December 2 - The entire NHL as represented in the comment section of an online recipe: Is the entire thing one long excuse to set up that Dallas Stars joke? I cannot confirm or deny. In reference to Feb 13th post and the worst contracts of NHL. Does the deal with NAS G Rinne still feel as awful as it did 11 months ago? Brilliant year, Sean. Gotta say, my favourite was probably the farewell.